28 days and 3 island sites into our Phoenix Islands Expedition finds the Woods Hole Oceanographic Institution (WHOI) fish team with 278 fish sampled, including 57 blacktip and grey reef sharks and 4 manta rays. The rest of the Seamans’ crew has taken to calling the WHOI fish team “the Tweedles”, but it remains unclear who is ‘dee and who is ‘dumb. Despite the confusion about our names, the smell of fish while visiting an island site is unmistakable and is a telltale sign of our current location. Our typical day starts around 04:30 by fishing a longline from the stern of the Seamans. As the day begins to break, we haul our hooks in and take to the skiff for some fishing closer to the reef. 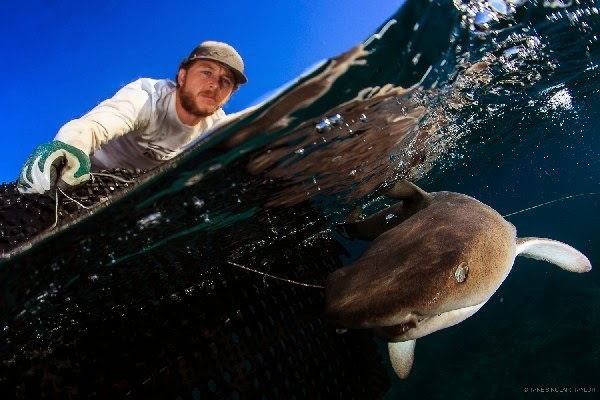 We spend the next several hours maintaining longlines for sharks and spearfishing for our reef fish samples. In-water sampling part 1 ends around 13:00, and the real work begins. We extract fish ear bones and collect muscle and tissue samples from the morning’s samples. As the heat of midday gives away to evening, we make a second trip on the skiff to repeat our earlier sampling and search for the inevitable hard-to-find fish species. All this hard work and foul odor isn’t without reward, though, as we’ve so far managed to fulfill nearly all of our sampling goals. We are collecting these samples from a representative group of coral reef species to better understand how energy moves through a reef from its primary producers like corals up to top predators such as sharks. If we can constrain the energy sources supporting a coral reef foodweb, we can better understand reef function and resilience to change. What a great opportunity we’ve had thus far with more to come in the last few weeks of our trip! We’re now on to day 28 since watching the lights of Honolulu fade in the distance and are currently < 5 nautical miles from Winslow Reef. We (as a ship and as a society) know very little about Winslow including what kind of land emerges from among the waves, if any. Excitement aboard the Seamans remains high as we ride some light winds and creep toward our next stop, eager to be among the few people in the world to have ever laid eyes on yet another amazing reef of the Phoenix Islands.